Scientists in Russia and the US have observed the fleeting existence of a new element with 117 protons, produced by firing calcium ions at a radioactive target. The discovery fills in a notable gap in the periodic table and bolsters the idea that neutron-rich superheavy nuclei could be extremely stable, perhaps having lifetimes of many millions of years. Before 1930 the periodic table was filled entirely with naturally occurring elements, the heaviest of which was uranium with 92 protons. Since then nuclear physics experiments have yielded a further 27 elements. In the early 1990s scientists at the GSI laboratory in Darmstadt, Germany, synthesized elements 107 through to 112, and over the last decade experiments at the Joint Institute for Nuclear Research in Dubna, Russia, have added elements 113 to 116 and 118. The Dubna discoveries were made by firing beams of the rare isotope calcium-48 at targets of heavy ions. Having a high ratio of neutrons to protons (28 versus 20), calcium-48 produces more neutron-heavy elements than other kinds of projectile, which is significant because the shell-model of the nucleus predicts that superheavy elements will become more stable as their neutron number goes up – reaching a peak, or “island of stability”, at 184. Until now, however, element 117 remained undiscovered. That is because the target material needed to produce it – berkelium-249 – is itself extremely hard to generate. But scientists at Dubna and the Lawrence Livermore National Laboratory in California, under the leadership of Dubna’s Yuri Oganessian, have now produced 22 mg of the substance after completing a two-year experimental programme that involved intense neutron irradiation and processing. After preparing the target the researchers then bombarded it with calcium-48 for 150 days using the heavy-ion cyclotron at Dubna. Oganessian and colleagues observed the tell-tale signs of the decay chains of two isotopes of element 117 – one having 176 neutrons and the other 177. Both chains involved a series of alpha decays in which the existing nuclide at each step was transformed into a new nuclide after losing two protons and two neutrons, with each chain terminating in nuclear fission. The former chain involved three alpha decays and occurred five times, whereas the latter consisted of six alpha decays and took place just once. 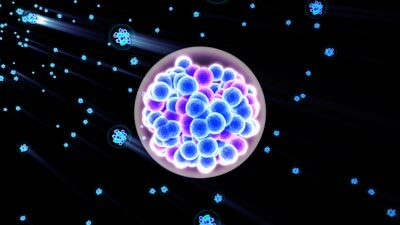 Intriguingly, the new element 117 containing 177 neutrons, the most neutron-rich isotope yet produced, has a half life (at 78 ms) that is 87 times longer than that of element 118 containing one fewer neutron. Also, the new isotopes of 115, 113, 111, 109 and 107 observed at Dubna each have one or two more neutrons than the isotopes of these elements detected previously and their half lives are 2.5–42 times as long. “These longer half lives give stronger evidence that there is a special stability to nuclei as you approach N=184,” says team member Joseph Hamilton of Vanderbilt University in Tennessee. Actually producing a nucleus containing 184 neutrons, however, is likely to take some time, according to Hamilton, given the intensely radioactive and neutron-rich ion beams that will probably be needed. He estimates that nuclei containing up to 181 neutrons could be produced in experiments “over the next few years”. But he points out that extremely stable superheavy isotopes could perhaps be found in nature, maybe in remote sites such as the ocean floor. “There are some predictions that they could last for very long times, even approaching the age of the Earth,” he adds. Walter Loveland, a chemist at Oregon State University, says that Oganessian’s group has produced a “convincing demonstration” of the first observation of element 117, which is dubbed “ununseptium”, though it is yet to be officially named by the International Union of Pure and Applied Chemistry. Loveland also believes that the work is a strong vindication of modern theories of heavy element synthesis.